The UK Government has just published the ‘National Infrastructure and Construction Pipeline’ report for 2018. 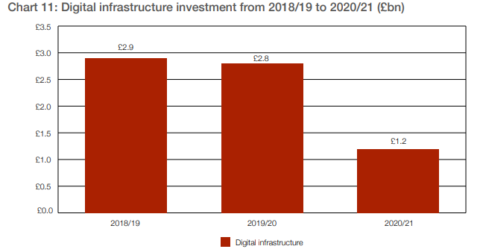 It gives an overview of investment (both public and private) that is underway or expected to be put toward 5G and full fibre (FTTP) between 2018/19 and 2020/21 (financial years). This year the pipeline report includes nearly 700 projects, programmes and other investments, and a projection of infrastructure investment over the next ten years of over 600 billion GBP (including 400 billion GBP of planned investment of which around 190 billion by 2021). The report reiterates what was disclosed in the Future Telecoms Infrastructure Review (FTIR) earlier in July 2018. The FTIR indeed highlighted changes needed to ease future full fibre and 5G mobile plans and was followed by an Ofcom consultation on the required regulation changes. and to meet the full fibre goal such as broadband delivery UK, the 400 million GBP of the Digital Infrastructure Investment Fund for altnet ISPs (400 million GBP), the Local Full Fibre Networks Programme (267 million GBP), rural full fibre pilots (200 million GBP) and CityFibre Full investment (2.5 billion GBP supported by Vodafone).